These delicious chili dogs are perfect for camping! Heat greased barbecue to medium heat. Bring beans, barbecue sauce and seasonings to boil in large saucepan, stirring frequently; simmer on medium-low heat 10 min., stirring occasionally. Meanwhile, grill hot dogs 10 min. or until heated through, turning occasionally and adding buns, cut-sides down, to the barbecue for the last 2 min. 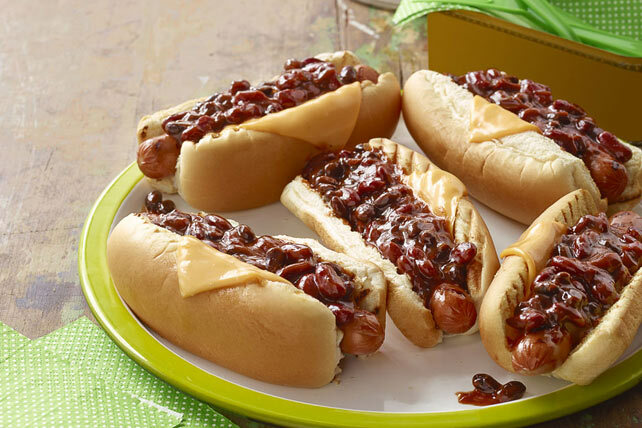 Fill buns with Kraft Singles pieces and hot dogs; top with chili. Top with chopped onions just before serving.